New Vintage Floral Elements collage sheets are at the Red Lead store in St. Louis and on our website. Plus click here for lots of new Spring and Easter too! •The size of 3 of the flower postcards are about 3" x 5"
•There are also 8 smaller images that are about 1-1/2" x 2" and would be perfect for handmade vintage style jewelry. 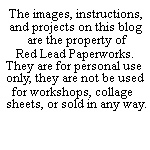 •The collage sheets are printed in the USA on 8-1/2-2" x 11" archival quality paper. Word Stencils - 60 Small Word Stencils!